Auburn Hills, Mich., May 5, 2008 - In response to direct customer feedback citing the prospect of rising gas prices as a top concern, Chrysler LLC today announces its own economic stimulus package: an exclusive gas price protection policy that eliminates the risk of further spikes in fuel prices. With the U.S. purchase of eligible Chrysler, Jeep and Dodge vehicles, customers can enroll in the “Let’s Refuel America” program and receive a gas card that immediately lowers their gas price to $2.99 a gallon, and keeps it there for three years. The offer is available at 3,511 U.S. Chrysler, Jeep and Dodge dealerships through June 2, 2008, and is available on vehicles ranging from popular new compacts, crossovers and minivans to full-size diesel-powered pickup trucks. The Let’s Refuel America program offers consumers a combination of the fuel price protection program and additional bonus cash up to $3,000 on available vehicles, including Chrysler PT Cruiser, Dodge Charger, Jeep Grand Cherokee, Dodge Dakota and Dodge Ram. Chrysler has a number of solutions to help our customers during these tough economic times. “Chrysler is committed to providing the best value, and the least worries, for our customers,” said Press. Chrysler’s lineup includes five models for under $20,000 that get 28 miles-per-gallon or better on the highway. To protect consumers from unexpected repair costs in the future, Chrysler models come with the industry’s best powertrain warranty, covering the original owner for the life of the vehicle. And Chrysler has made a number of its most popular options standard on its New Day Package vehicles. Chrysler currently offers six models that get better than 28 miles-per-gallon on the highway: Chrysler Sebring, Chrysler Sebring Convertible, Dodge Avenger, Jeep Compass, Jeep Patriot and Dodge Caliber. Through April, the six of these models combined have higher sales than in the first four months of 2007. The recently-launched 2009 Dodge Journey comes with an available 173-hp four cylinder engine, helping it achieve best in class fuel economy. The Jeep Grand Cherokee diesel 3.0-liter engine provides a class-leading driving range of approximately 450 miles and gets an estimated fuel economy of 18 miles/city and 23 miles/highway for 4x2 models and 17 miles/city and 22 miles/highway for 4x4 models. Outside of North America where fuel-saving diesel engines are in higher demand, Chrysler offers 17 models with diesel powertrains. This fall, Chrysler will launch in the United States, two new hybrid SUVs, the Dodge Durango Hybrid and Chrysler Aspen Hybrid, boasting a fuel economy improvement of more than 25 percent overall, and 40 percent in the city. In 2010, the Dodge Ram Hybrid will reach the market. Chrysler is currently in the midst of a $3 billion powertrain investment offensive to develop new fuel-efficient powertrains and axles for our next-generation models. Chrysler supports the federal government’s new dramatically increased CAFE fuel economy standards, which will increase fuel efficiency by an average of 40 percent by 2020. Recently, Chrysler joined the US Climate Action Partnership, working to find solutions to global greenhouse gas emissions. * 76 percent of the community is "very concerned" or "extremely concerned" about fuel prices. * 83 percent of the community responded that fuel prices will affect their summer vacation plans. 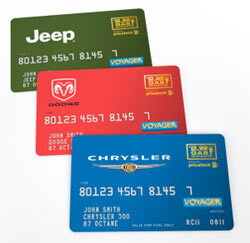 The Let’s Refuel America gas card program works when a customer purchases a new and unused Chrysler, Jeep or Dodge vehicle and selects the program in lieu of other available incentives. The customer is provided with the registration process documentation and registers providing their required personal information via the dedicated web site or toll-free 800 number. Once registered, the customer receives their gas card and separately, their Personal Identification Number (PIN) within 4 to 6 weeks of application. The customer then swipes their Let’s Refuel America Gas Card at an eligible gas station, selecting up to 87 octane regular, E85 fuel or diesel fuel, and enters their PIN to begin the fueling process. After the fuel transaction occurs, the customer’s personal credit card (identified in the registration process) is charged $2.99 per gallon. The following vehicles are not eligible for the Let’s Refuel America program: All SRT models, Dodge Viper, Dodge Challenger, Dodge Ram Chassis Cab, Chrysler Crossfire, Jeep Wrangler and Dodge Sprinter. * If mid-grade or premium unleaded fuel is purchased, the customer will be billed for the $2.99 plus $.15 per gallon for mid-grade (88-89 octane) or plus $.30 for premium (90-94 octane). All other grades of fuel higher than 94 octane are not covered under this program and the full pump price will be billed through to the customer plus a $2 service fee per transaction with no gallon usage penalty. If customer purchases unleaded gas (including E85) on a diesel card, or diesel fuel on an unleaded gas card, the customer will be billed the full pump price plus $2 service fee per transaction with no gallon usage penalty.